Sometimes the kids just gotta dance! Pull out your favorite music and start tapping your toes. Here's what I did for my dancing storytime. I started off with one of my favorite songs - Head, Shoulders, Knees, and Toes. This was perfect to kick off our morning because it's familiar to most kids and it helped my somewhat-shy crowd loosen up a bit. I like to start off slow and then do the song several times, going faster with each verse. Of course the last verse is superfast and the kids dissolve into giggles. To get the kids to sit back down again after a song like that, I lead them in a little activity I learned from a librarian I once worked with. Put your hands on your... chin, shoulders, etc. And you're so close to the ground, sit down and have a seat. 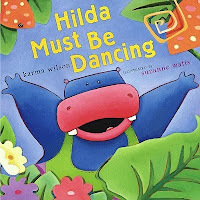 Next, I read one of my favorite books for its bright pictures and interesting vocabulary - Hilda Must Be Dancing by Karma Wilson. 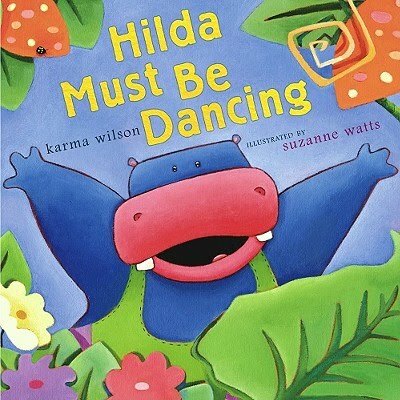 Hilda the hippo loves to dance, whether it's the tango, the cha-cha, or ballet. But whenever she dances, her bumps and crashes echo through the jungle, prompting all the other animals to say "Hilda must be dancing!" As the jungle animals try to interest Hilda in another hobby, we wonder can they ever reach a compromise? Then I brought out a shorter book, Hop Jump by Ellen Walsh. 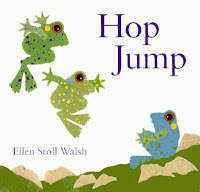 Betsy the frog is tired of hop, jump, hop, jump, every day the same thing! So she starts to dance and soon the other frogs join in. After our books, I passed out colorful scarves to the kids so we could do a little dancing. (The scarves we have are the activity scarves from Lakeshore Learning. They are very bright and the kids love them!) First, we danced to Jim Gill's Silly Dance Contest from his album The Sneezing Song and Other Contagious Tunes. We also tiptoed, jumped, and danced 'round the room. At random intervals, I'd call out "And the drum says STOP!" and the children would freeze. We march and we march and we march and we STOP! And we all turn around! Whee!!! We marched and danced to that chant. And both those activities are from Betsy Diamant-Cohen's Mother Goose on the Loose training (I can't recommend it enough!). 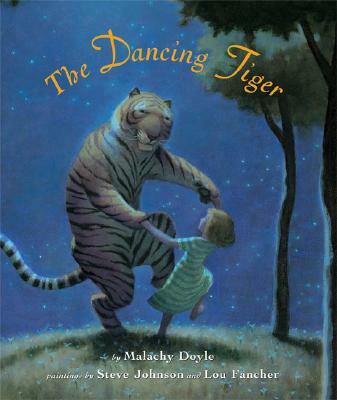 Lastly, we needed something to quiet us down, so I sat the kids down and we shared a quiet sort of book, The Dancing Tiger by Malachy Doyle, illustrated by Steve Johnson and Lou Fancher. This was a new-to-me book, found on our shelves during my quest for display titles. A young girl discovers a tiger that dances by the light of every full moon. When she approaches him, he says that if she won't tell anyone about him, she can come and dance with him on every full moon, which she does until she's old and gray and introduces the tiger to her granddaughter. It's a dreamy, whispery sort of book, just right for settling everyone down after a high-energy storytime. That sounds lovely and fun! I know if I had been there I would have loved it. Good job, Twinkletoes. Thank you for the post. Great storytime. Thanks for sharing!